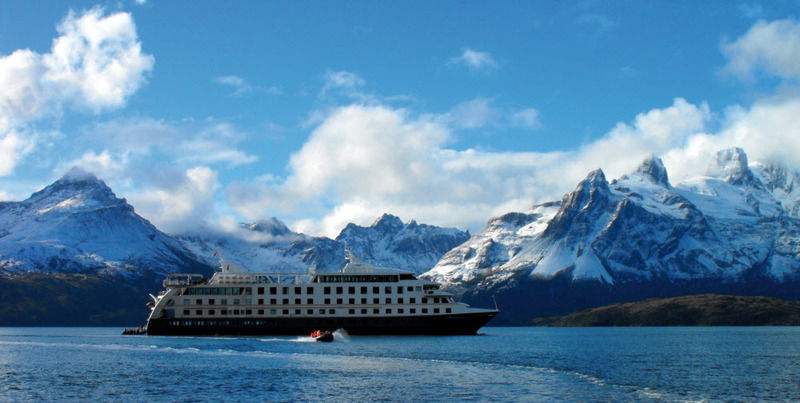 Explore the remote fjords of Tierra del Fuego and surrounding Patagonian archipelagos on the Cruceros Australis. The fleet comprises of two cruise ships, namely the Via Australis ( accommodating 136 passengers) and the Stella Australis (accommodating 210 passengers). 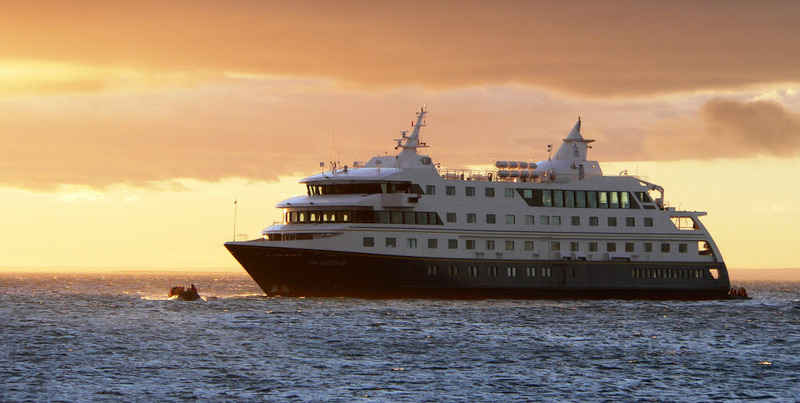 From September to April each year, these cruise ships sail weekly from Punta Arenas (Chile) and Ushuaia (Argentina). 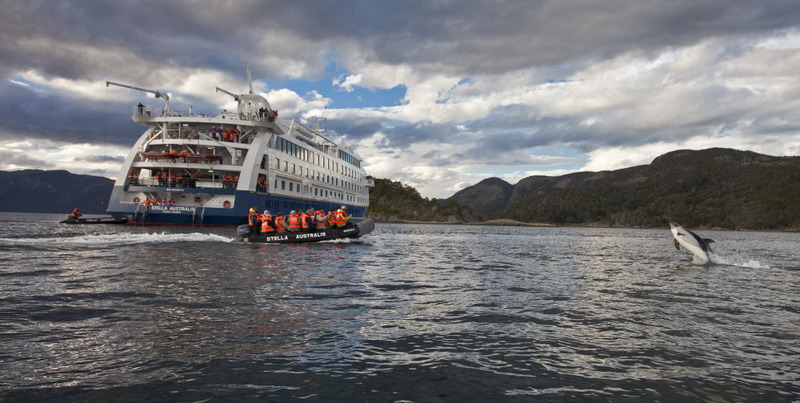 Navigating the Strait of Magellan and the Beagle Channel down to Cape Horn, these vessels allow you to explore one of the most beautiful wilderness regions in the world: Patagonia and Tierra del Fuego, at the southernmost tip of South America. Each voyage, be it 3 or 4 nights long, takes you through channels, bays and fjords; sail past glaciers, snow-capped mountains, islands and unexplored forests of exceptional beauty. The daily shore excursions provide many opportunities for guests to see penguins, elephant seals and the astonishing glaciers which descend from the Darwin Mountain Range (the last part of the Andes). 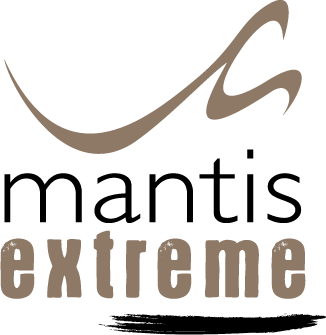 The expedition team and crew are multilingual, ensuring that you will have a unique experience. 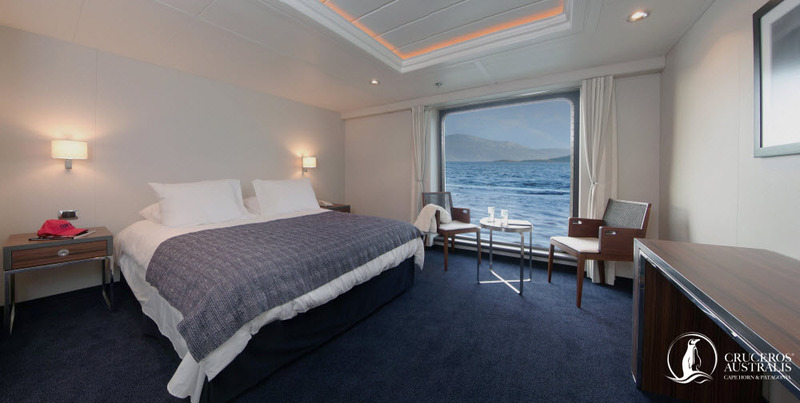 On Via Australis all cabins are 15 m2, with large picture windows, temperature control, private bathrooms, cabin to cabin telephones, programmable electronic safes and hairdryers. Water is replenished on a daily basis. The only difference between the categories (B, A, AA and AAA) is the level of the deck they are located on. On Stella, the standard cabins are 16.5 m2, whilst the four superior cabins are far more spacious at 20.5 m2 and offer a king size bed, small table and chairs. The facilities in each cabin are identical to those of Via Australis. In both vessels the twin cabins can be configured as large double beds and there are proper double cabins. There are no laundry service facilities on board, nor is there TV or internet available. Mobile networks are only available when the vessels are close to Ushuaia or Punta Arenas. Main announcements are broadcast from the Bridge or Reception into your cabin. 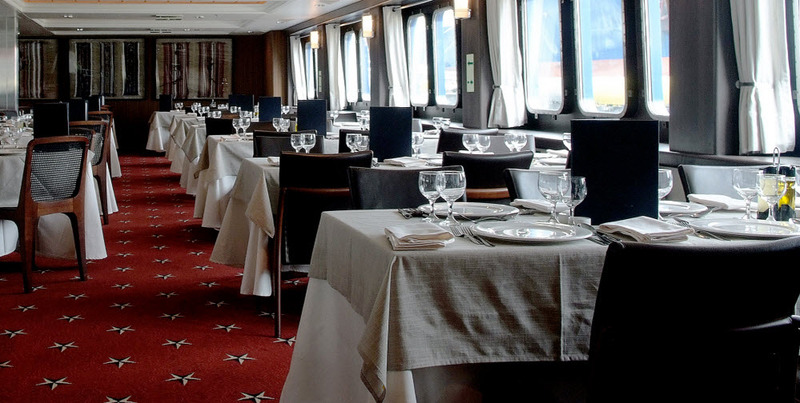 Each cabin has a detailed program for the whole cruise, indicating the times of lectures and disembarkations. On Via Australis the two big lounges are furnished with tables, chairs and sofas. 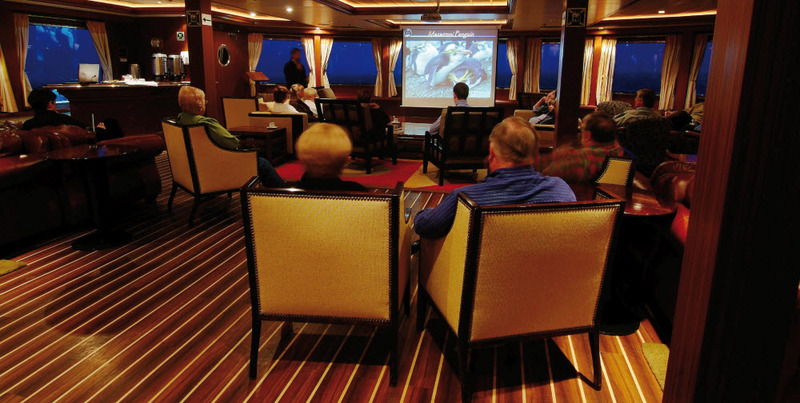 Both lounges are equipped with audio-visual equipment where guests can attend daily lectures on flora, fauna, history of the area, glaciology, etc. The Sky Lounge bar is a great location to enjoy local and international drinks. The Yamana Lounge bar offers passengers coffee, tea, hot chocolate and pastries, available throughout their time on board. The Stella Australis has three lounges with similar features. As these are expedition vessels, the atmosphere is very relaxed and informal, with no dress code on board. At the Patagonia Dining Room all breakfasts and lunches are buffet style and the dinners are a la carte, with only one sitting. Enjoy International cuisine and Patagonian specialties, served with a wide selection of Argentine and Chilean wines. Passengers are invited to visit the bridge while cruising. Captain and Officers will be pleased to explain how they operate the vessel, show the charts, etc. The big screens in each lounge also display the map and the indication of the current location of the vessel and the path it has already taken. Smoking on board is permitted only on the terrace located on the upper deck. There is a doctor on board. We promise you a truly memorable journey, sailing through the Strait of Magellan and Beagle Channel to explore one of the most beautiful and untouched places on Earth: Patagonia. Also included in your journey is the vast and dramatic region of Tierra del Fuego. You will be completely captivated as you sail past imposing glaciers and through spectacular channels on an unforgettable voyage to Cape Horn – the edge of the world. The stunningly beautiful landscape with its resilient flora, magnificent marine mammals and the Magellan Penguins will both enthrall and amaze you in this voyage of a lifetime. Take advantage of this incredible opportunity to explore deeper within this unique part of the world, by combining one of the expedition itineraries aboard one of the vessels with exploring two of the region’s areas of outstanding natural beauty. Torres del Paine National Park, just two hours away from Puerto Natales in Chile and the Perito Moreno Glacier, an hour away from El Calafate in Argentina.